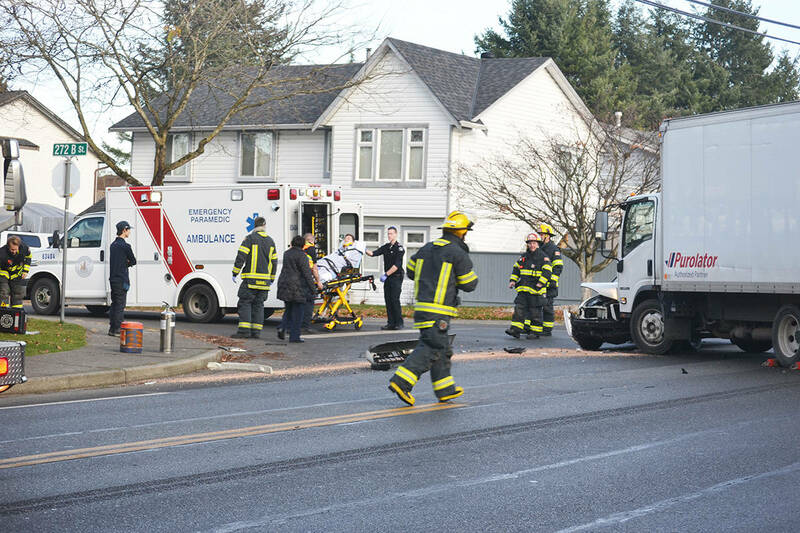 KURT LANGMANN PHOTO A delivery van and small car collided on 32 Avenue in Aldergrove at around 1 p.m.
A portion of 32 Avenue just east of 272 Street is closed to traffic Wednesday afternoon while emergency responders dealt with a collision involving a Purolator delivery van and a small white sedan that took place around 1 p.m. The delivery van struck the driver’s front side of the westbound sedan, setting off the car’s air bags and pushing it to the side of the road. A man who appeared to be the driver of the car was wearing a neck brace and he walked to a gurney which was then pushed into the ambulance for transport to hospital. His injuries did not appear to be life-threatening. The van’s driver was not injured.